Fillers made of hyaluronic acid can be used to increase facial volume that has been lost due to ageing, to plump out sagging and wrinkled skin. Alex’s favourite use for Hyaluronic acid fillers is for lip augmentation. 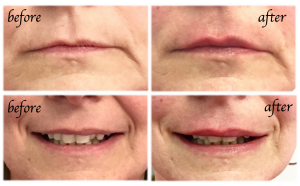 The aim is to restore volume in aging lips to achieve fuller, more defined lips but not beyond what could be considered aesthetically pleasing. This is usually done under local anaesthetic as lips are sensitive. Lip fillers can last between 9 and 18 months. Softer hyaluronic acid fillers are available to subtly fill fines lines, most commonly around the mouth, also known as smoker’s or lipstick lines. These softer fillers last for about 9 months. Hyaluronic acid fillers are used to fill and smooth out wrinkles and furrows and to add volume to the face, typically in the cheekbone area to help to a heart shaped face. It also brings moisture to the surface, giving the area a full, fresh, and supple look. The results of the injections can last 18 months. 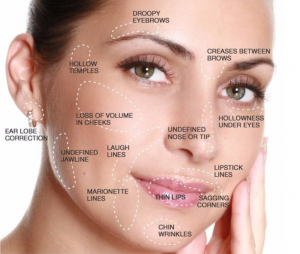 Hyaluronic acid fillers are extremely safe, with very little that can go wrong as it is a naturally occurring molecule.